Why Does My Cockatoo Shake? All birds exhibit body language, no matter how obvious or subtle, conveying something about what your bird wants or needs. Cockatoos shake for a different number of reasons and, in some cases, shake only certain parts of their body such as the wings or abdomen. While not all birds exhibit the same gestures, basic and universal bird body language is helpful in deciphering what your bird is saying. Wing shaking is seen in birds that are anxious or fearful. Birds placed near doors or windows are constantly on the lookout for predators. As a result, they're unable to relax and simply enjoy being a bird. Extremely active homes, homes with small children and unexpected noises can agitate and frighten birds. Birds that have had a bad experience or a frightful experience may shake when reminded of that event. 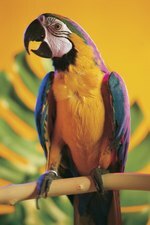 Reduce stress by speaking to your parrot in a calm voice and reassuring it that it's in a safe environment. Place cages away from high-traffic areas with one side of the cage against the wall to ensure your cockatoo feels safe and secure. Place your cockatoo on an appropriate diet that includes fresh fruits, vegetables, nuts and water to prevent behavior problems that result in the bird becoming agitated or stressed due to malnutrition. Body and abdomen shaking are generally seen when birds experience temperature changes such as caused by cold drafts or temperatures produced by air conditioning units. Cages near windows and doors or in cooler areas of the home may deny your bird adequate heat in cooler weather. Birds are especially prone to being cold and shivering to produce heat after baths or being misted. Avian heating lamps provide heat directly into the cage area (ideally pnly one corner) to offer birds a cozy place to perch. Snuggle tents and buddies protect birds from drafts and help maintain warm body temperature. Heated perches can combat drafts and chills keeping your cockatoo warm and cozy. Use cage covers at night and to drape your bird's cage after it has bathed to reduce draft exposure and prevent chills. Older, sick and malnourished birds are susceptible to being both stressed and cold. The key to prevent shivering in your cockatoo is to maintain a calm, cozy environment and feed a quality diet with fresh water. When in doubt, contact your avian veterinarian to schedule a checkup to rule out any potentially fatal illnesses.